Keith Camera Co. in Los Angeles, California, was a company that made cameras and accessories. In its product portfolio were view cameras, TLRs, 35mm bulk film backs, and maybe some other products. 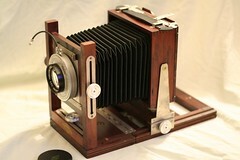 A spectacular product of Keith was its twin lens double bellows 4x5 large format camera. This page was last edited on 12 May 2011, at 05:32.